As I sorted through his materials, I located items such as photographs of clocks, drawings of clock works, and magazine articles on clock making. However, the documents that interested me the most were the detailed hand-written genealogies my great-grandfather wrote on a number of early New England clockmakers, including the Mulliken family, Simon Willard, and Benjamin Bagnall. Although a number of people in my family enjoy hearing about my latest family history discovery (or at least I tell myself that they do), I am the only one in my family who conducts genealogical research. 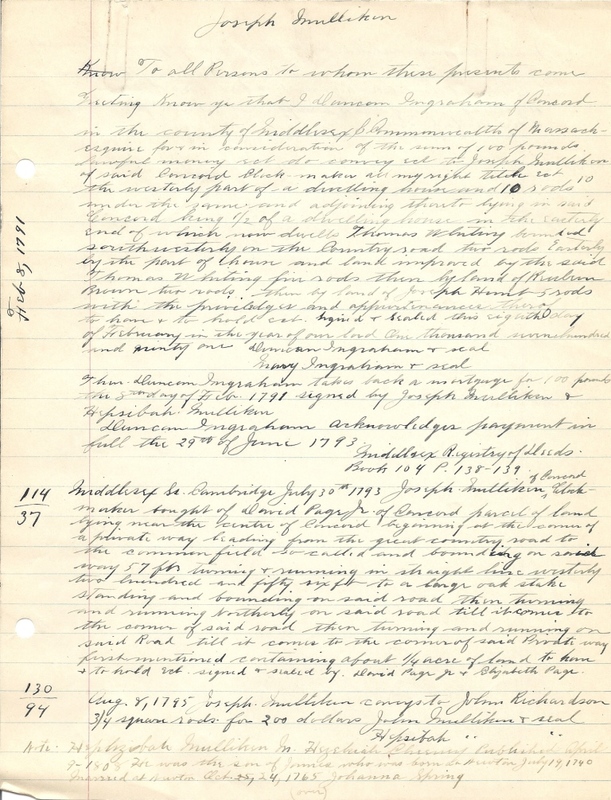 I felt connected to my great-grandfather as I leafed through his pages of notes, appreciating how time-consuming a task this was for him, especially without research tools such as searchable databases and digital collections. He transcribed land and probate records, genealogies, and a number of marriage and death notices published in early New England newspapers. And as a researcher, I was excited to see that he even wrote down the sources he used for his research. James Conlon gave lectures on the history of New England clock making at a number of local historical societies. Hand-written copies of these lectures are included with his personal papers. One particular item of interest is the lecture he gave at the 27 October 1934 meeting of the Boston Clock Club titled “Benjamin Bagnall and his Clocks.” I located a copy of the Club’s meeting minutes for this date, which describes James Conlon as someone who “has long been engaged as a clock maker and probably has had a broader experience with fine clocks than any other person in this section. In addition to his practical experience, he has in years past devoted a great deal of time and energy to consideration of the origin and history of New England clock makers.” Since the topic of this meeting was Benjamin Bagnall, also recorded in the meeting minutes was a list of institutions and individuals who owned Benjamin Bagnall Tall Clocks, including the New England Historic Genealogical Society and my great-grandfather. 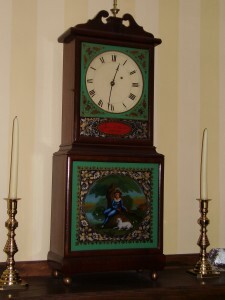 Photographs of these clocks were displayed at this meeting, including two photographs of the Tall Clock owned by NEHGS. 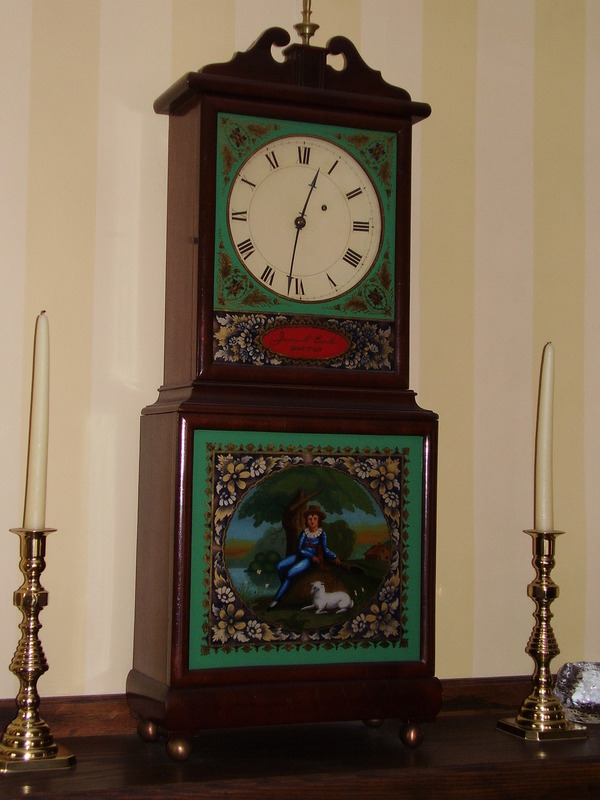 This clock was made by Benjamin Bagnall in 1725, and was given to the Society by Martha Wheelright in 1867. I have walked by this clock on a number of occasions at work, so it was interesting to read about its inclusion in the Benjamin Bagnall presentation. I’m really glad I had the chance to work on this project, since it provided me with a unique opportunity to learn more about my great-grandfather and his profession. ago, the maker of this clock, landed in Boston, at the old House of Palmer Bachelder & co.
30 years, on Bromfield Street. Any information about any of this would be interesting to me. I live in Seattle.